Creative making and tinkering takes place in many settings, and is a rich context for learning about science, technology, engineering, and art. What are people learning as they make? How do we support making experiences for famlies with young children? What's are the various ways that facilitators encourage (or discourage) fluency with technology and materials? How does a maker identity develop and does that have consequences on STEM later engagement? Brahms, L. & Crowley, K. (2016). Making Sense of Making: Defining Learning Practices in MAKE Magazine. In K. Peppler, E. Rosenfeld Halverson, & Y. B. Kafai (Eds). 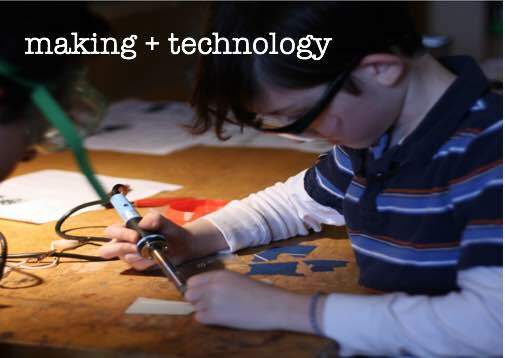 Makeology: Makers as Learners. New York: Routledge. Brahms, L. & Crowley, K. (2016). Learning to Make in the Museum: The Role of Maker Educators. In K. Peppler, E. Rosenfeld Halverson, & Y. B. Kafai (Eds). Makeology: Makerspaces as learning environments. New York: Routledge. Bernstein, D. & Crowley, K. (2008). Searching for Signs of Intelligent Life: An Investigation of Young Children's Beliefs About Robot Intelligence. Journal of the Learning Sciences, 17:2, 225-247. Bernstein, D., Crowley, K. & Nourbakhsh, I. (2007). Working with a robot: Exploring relationship potential in human-robot systems. Interaction Studies, 8 (3), 465-482. Funding provided by: National Science Foundation, Institute of Museum and Library Services, and Children's Museum of Pittsburgh.